Wow! Has it been an insanity-filled week! And it isn’t over yet! Music classes, birthday party, Easter party, Easter dinner…and the cupcake chaos that overtook my house! I was partially responsible for putting on an Easter party for our entire ward (congregation) at church, and once again, had no budget, so we had to get really creative. One way we did this was to get people to donate undecorated cupcakes and I had the Activity Day Girls (8-11) come to my house and crank out a couple hundred cute and creative Easter cupcakes. This meant that I had to be organized cause 15 pre-teens running around can deteriorate very quickly. I demonstrated exactly how to make each style of cupcake I chose. I thought I would share with you. 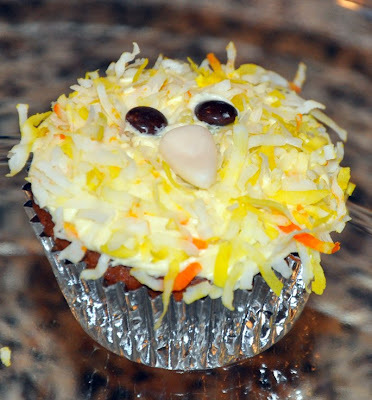 These were all easy enough for the girls and pretty quick if you have the ingredients on hand (Read: It might not be too late to whip these up if you are looking for cute ideas for Easter dinner). 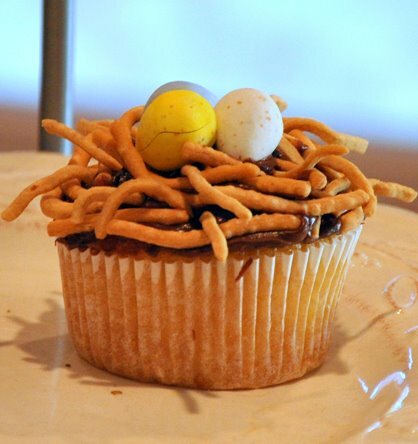 I thought I designed the above cupcake based on my chow mein noodle Easter nests. But it turns out bhg had the same idea. 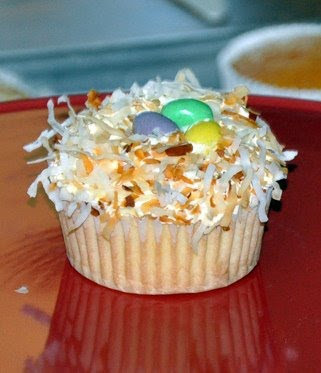 I mainly did this to help those who don’t love coconut as used in the next two cupcakes. Has your Easter been full of insanity or simple spring celebrations! Can’t wait to show you the rest of the Easter party and my daughter’s birthday party! Hope you and your family are enjoying this special day! You are not only "insanely creative", you are also very brave and blessed to have pulled off these adorable creations with 15 pre-teen assistants!